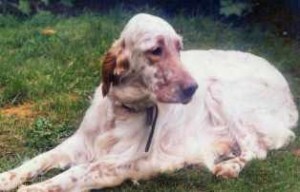 When my beloved springer spaniel, Minsky died at the grand old age of 20 years, I was heartbroken. She was irreplaceable. I knew I wanted another dog, but not right away. So I spent the next 12 months saving up 20p pieces and researching what sort of dog could possibly fill the hole in my heart and my life. 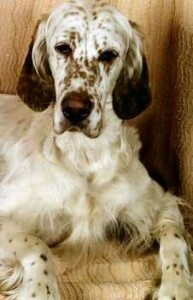 I narrowed it down to three breeds, none of which I had actually met in real life and whilst on holiday in France watched a lively orange belton English Setter dog having a whale of a time with everybody and anybody at a festival of sport. He decided me – an active beautiful dog with a temperament to die for. At this stage, Poppy was frightened of everything so changing her name wasn’t an option. I allowed her to gradually come out of her shell and get to know me, started taking her for walks where she encountered such terrifying things as bushes, bins, paper blown in the wind, cars – anything made her jump. So I thought training classes would be a good idea and we signed up. On arrival, it was a Ringcraft Class to learn how to show – Poppy spent the first two classes under my chair ! However the atmosphere and opportunity to socialise with other dogs brought her out of herself and she began to really enjoy life. 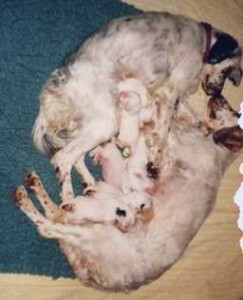 … We kept two of Poppy’s puppies – a blue dog called Flash and an orange called Fleet. It was at this stage that we found out why Poppy had been hearing tested – there was deafness in her sire’s line. So we BAER tested the puppies and they were all fine. Since then all our stock has been tested. Thalice got her wish, once she was old enough she had her first litter which was, sadly for her, only two puppies, neither of which we could keep. A second litter followed on and we were able to keep Delyth – another light tri-colour and from a third litter we kept Sapphire – a dark blue belton. Thalice elderly now and would still like her own puppies, but she has to make do with her grandchildren. Delyth has presented her with a litter from which we kept Rhian (another tri-colour) and Sapphire has also had a litter, two of whom have gone to permanent, loving show homes.